How to create an ASP.NET MVC project management application using DayPilot MVC Gantt chart control. Includes C# and VB.NET source code and a sample SQL Server database. This tutorial shows how to use DayPilot ASP.NET MVC 5 Gantt chart control. The BackendUrl property is required. It points to the MVC controller that will handle the AJAX requests. Now we will create a new controller for handling the AJAX events. We will create a new class called "Gantt" derived from DayPilotGantt. This class will transform the incoming AJAX requests into server-side events. No we will use the controller to configure the Gantt chart timeline. We will add an event handler for the "Init" event. This event is called right after the Gantt chart initialization on the client side. It will let us load the Gantt chart data and adjust the configuration. First, we set the start date to October 1, 2014 and time range to 60 days. The UpdateWithMessage() call sends the changes to the client side and displays a message ("Welcome!") using the built-in message bar. Now we will add task loading code to the OnInit event handler. These fields allow us to load task start and end date and its location in the task hierarchy. The helper Db.GetTasksFlat() method returns a DataTable with all the records. In this example we are using the DataTable rows as the data source but it can be any Enumerable of custom objects. The second parameter specifies the field mappings. The TasksFromEnumerable() method loads the task tree into the Tasks property. We will load the task links using a similar procedure. The links can also be loaded directly using Links property but we use the LinksFromEnumerable() method to load them directly from the data source. The Gantt chart control lets us display custom data in additional columns. By default it displays a single column with the task name. The Title will be used for the column header and Property will be used to load the default data for each row. You can also build the column content manually. We will use this option to display the task duration in the third column. The same applies to task resizing. Just add an event handler that saves the updated task start and end. The Gantt chart control supports drag and drop link creating. It is enabled by default. 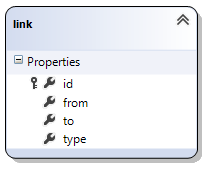 The OnLinkCreate event handler allows us to save the new link in the database. 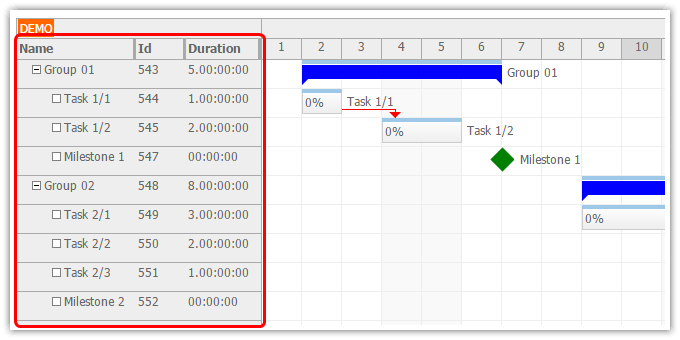 The Gantt chart supports drag and drop changes to the task hierarchy. The Notify handling type means the row position will be updated on the client side first. The server-side event handler will be fired after the change. No refresh is required. You may only need to force the update if the hierarchy update affect some of the row or task properties that need to be updated from the server side. 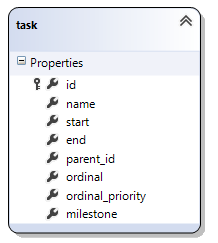 We use the ordinal and ordinal_priority fields to store the task order. The OnRowMove handler updates the fields and compacts the numbers in the ordinal field after the changes are made. The Gantt chart control includes built-in support for adding a new task. The handler will create a new task at the top level and refresh the Gantt chart using Update(). ASP.NET project management web application created using DayPilot ASP.NET Gantt chart control. Includes C# and VB.NET source code. Spring Boot application for project management that uses DayPilot Pro to display a Gantt chart. How to export the ASP.NET Gantt Chart control to a PDF file. Includes a downloadable Visual Studio project. C# and VB.NET source code. How to create a Gantt Chart application in ASP.NET. Vue.js application that shows how to integrate and configure a Gantt chart. The Gantt chart component displays a timeline for a hierarchy of tasks and milestones. How to display a Gantt chart with DayPilot Scheduler.